Dokos is situated between Ermioni on the mainland and to the west of the Saronic island of Hydra. 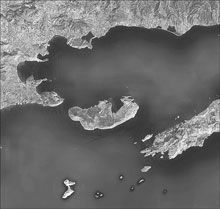 Unconfirmed allegations have surfaced to the effect that the small islet of Dokos, in the Saronic Gulf, accorded protected status because of the valuable archaeological findings there, is to be sold for a holiday resort, according to reports in Greece and Cyprus. Residents of the nearby island of Hydra are concerned, as are archaeologists who have been excavating in the area for years. Although the reports appear to be without foundation, they recall methods used in other similar cases, in which there was pressure to lift a site’s protected status for the purpose of profit. Although the entire island has been declared a protected zone, from time to time proposals have been raised regarding its “development”, in the sense usually understood in Greece to mean unrestricted construction. This latest rumor has circulated in a way that is customary in the real estate business: A Cypriot firm, the Kerlengou Group of Companies, released an interview with its CEO Costas Kerlengou in the form of a sponsored page in the Cypriot daily Phileleftheros on December 24, 2006. Among the business plans Kerlengou discussed was the purchase of islands in Greece by the group’s subsidiary, Kerlengou Island Investments Plan Ltd. The news was also picked up by other Cypriot media. Kerlengou let it be understood that negotiations to buy Dokos were well advanced. The story spread to the Greek media, where Dokos was said to have already changed hands and that plans were ready for a 12,000-square-meter development, including a hotel, bungalows, marina and other installations. The case is not unusual, particularly with regard to the way business firms leak “information” to the media. Greek daily Kathimerini spoke to Kerlengou, who said he had not yet bought land on Dokos, but claimed that negotiations with some of the owners, who hold 20-30 percent of the island, were at an advanced stage. He said the owners had told him that building restrictions on the island were no longer in force. Nevertheless, he had not sought to contact the Municipality of Hydra for information on the island’s protected status. The Municipality confirmed that. “There has been a rumor that the island has been sold, but no candidate buyer has contacted us,” said both Hydra Deputy Mayor Giorgos Koukoudakis and Head of the Municipal Council Panayiotis Markantonis. A lawyer representing one of the owners at a meeting with Kerlengou told Kathimerini there were reservations regarding the seriousness of the undertaking; that Kerlengou had told the media he had bought Dokos even before he had contacted the owners. Oldest shipwreck in the world > Dokos is a small rocky island of 12 square kilometers lying between Ermioni on the mainland and the Saronic island of Hydra. Known in antiquity as Aperopia, it was inhabited from the Neolithic period (4th millennium BC) and flourished after the 13th century BC with settlements in the areas of Myti Kommeni and Ledeza. Ruins of Proto-Helladic, Late Helladic and Hellenistic settlements survive, along with Hellenistic and Byzantine monuments. In 1975 the oldest shipwreck in the world, the second Proto-Helladic period, 2700-2200 BC, bearing a cargo of pottery, was found near the island at a depth of 15-30 meters, and was excavated in 1989-1992.